Traverse City Light & Power (TCLP) recently took the next step in their efforts to build out a citywide Fiber-to-the-Premise (FTTP) network. City leaders issued a Request for Information (RFI) for Partnership for Deployment; responses are due June 29th. TCLP has had their own fiber network in place for about a decade. The city uses it to offer free Wi-Fi in the downtown area and leases excess capacity to anchor institutions, such as local hospitals and the school district. Like many other municipalities with similar infrastructure, TLCP invested in the network as a way to enhance electric services and provide communications between substations. About a year ago, the community utility board decided unanimously to move forward with plans to adjust their capital improvement plan in order to fund fiber optic connectivity throughout the city. Their decision came after considerable deliberation on whether or not to expand their existing infrastructure and if the city should fill the role of Internet service provider (ISP). They’ve had past conversations with local ISPs and a cooperative that is in the process of installing fiber within its service area. TCLP has also discussed various models, such as open access, retail services, and public-private partnerships. The community is taking time to do their homework and consider which approach is best for their unique situation. A feasibility study completed last year recommended either operating a citywide network as a city utility or leasing it to a single partner. Last May, TCLP board members decided to seek out a partner rather than pursue the municipal utility option. The current RFI seeks a network operator to design, build, operate, and maintain what TCLP describes as the first phase of the project. RVA Market Research & Consulting is a firm known for its ability to provide detailed review, analysis, and forecast for Fiber-to-the-Home (FTTH) deployment. They also offer information on the needs and desires of current and potential subscribers regarding other telecommunications issues. This week, RVA Founder Michael Render visits with Christopher about the firm’s work and discoveries. The organization makes contact with Internet access providers, experts, vendors, and people or businesses to get the latest opinions and thoughts on services and satisfaction. They’re experts at interpreting that data to help organizations such as ISPs, investors, nonprofits, local government, and others create successful strategies for future initiatives. While RVA and Michael Render are well-known in the telecom industry, the company works in other areas, tailoring their extensive reports and recommendations to the needs and specific questions of their clients. In this interview, Michael and Christopher discuss some of the changing trends he’s seen over the years in how subscribers use connectivity, what subscribers are looking for in a provider, and what subscribers consider the most important factors relating to Internet access. They touch on the differences between subscribers living in single-family dwellings and apartments or condos and Michael provides some insight into how the demand for FTTH has changed over the years, including how munis have influenced growth. Check out RVA’s recent report for Next Century Cities, Status of U.S. Small Cell Wireless / 5G & Smart City Applications From The Community Perspective. They’ve also provided the research for a 2016 graphic from the Fiber Broadband Association (formerly the FTTH Council) on multifamily home values and FTTH. Check out more at the RVA, LLC website. Community leaders in Hudson, Ohio, are likely to ask voters this fall to approve bonding to expand their municipal fiber optic network, Velocity Broadband. At their last City Council meeting, the members heard the first of three readings for a resolution to propose bringing the question to voters. The network currently offers high-quality connectivity to local businesses, but according to city spokesperson Jody Roberts, it’s time to take the infrastructure into residential neighborhoods, which was always part of Hudson’s vision. At the May 1st council meeting, Roberts also said that Velocity is now operating in the black, which means now is a good time to take gigabit connectivity to residents. Hudson is like many other small cities, in that large national providers don’t see a justification for investing in fiber in non-urban residential areas. With a population of around 24,000, the community needs to remain competitive. Hudson began with fiber optic infrastructure to municipal facilities, which they built out incrementally over a period of about ten years. By 2015, they had started offering gigabit service to businesses, which have embraced the faster, more reliable service. By the fall of 2016, they were ready to issue an RFP for a feasibility study to examine a citywide Fiber-to-the-Home (FTTH) network. Internet access isn't effective when it takes forever to load a single webpage or when subscribers spend hours babysitting their computers to ensure files make it through the upload process. At the Institute for Local Self-Reliance, we create maps analyzing publicly available data to show disparities in access and highlight possible solutions. We've recently taken an in-depth look at Georgia and want to share our findings with two revealing maps. According to the FCC's 2018 Broadband Deployment Report, 29.1 percent of the state's rural population lacks broadband access, but only 3 percent of the urban population shares the same problem. Cooperatives and small municipal networks are making a difference in several of these rural communities. 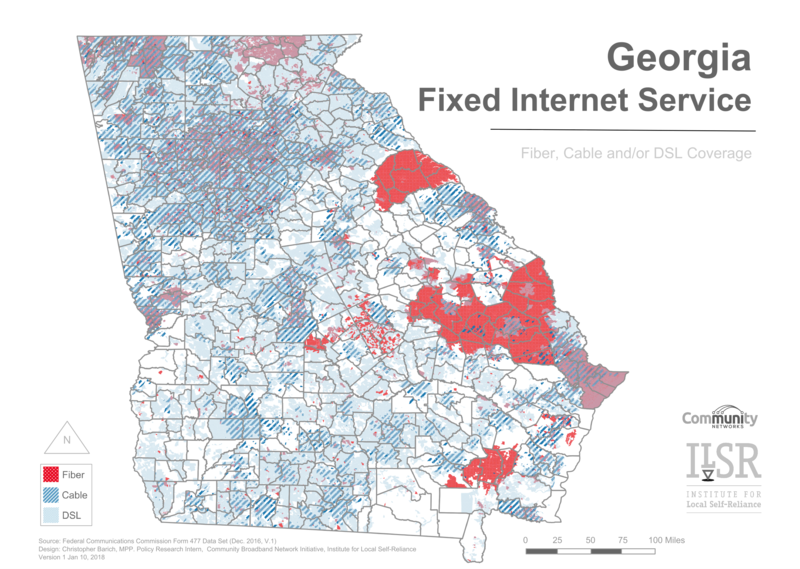 The map below shows what kinds of technology Internet Service Providers (ISPs) are using to offer Internet service to homes or businesses in Georgia. To differentiate areas of the state, the lines represent the subdivisions within counties. Our analysis focuses on wireline technologies, specifically fiber, cable, and DSL. Satellite and fixed wireless services are too dependent on the weather and the terrain for our analysis. In rural Georgia, premises with wireline access most often rely on DSL; cable and fiber tend to be clustered around towns and cities where population density is higher. Google, for instance, operates a fiber network within Atlanta, Georgia. The large amount of fiber in the eastern half is the Planters Rural Telephone Cooperative, one of the many rural cooperatives that are taking steps to help rural communities obtain the access they need to keep pace with urban centers. Deploying, maintaining, and operating a wireless network is easy, right? You just put up your equipment, sign up subscribers, and start raking in the dough, right? Not even close, says Travis Carter, one of the co-founders of US Internet and our guest for episode 301 of the Community Broadband Bits podcast. He should know -- he's deployed both wireless and fiber networks in Minneapolis. In this episode, we get an update on US Internet’s progress on its fiber deployment. Travis also compares what it’s like to own, maintain, and operate each type of network. There are pros and cons of each and each is better suited for different environments and situations. Travis and Christopher also talk about some of the marketing approaches that US Internet use after being in business for several years and determining what works in the Minneapolis market. He describes how a local company can compete against the big national ISPs by giving subscribers a good product, maintaining good customer service, and keeping an eye on long-term goals. Learn more about US Internet in episode 194 of the Community Broadband Bits podcast. This show is 34 minutes long and can be played on this page or via iTunes or the tool of your choice using this feed.